Released on Monday, the one-ounce coin features the historic Royal Arms design, celebrating the royal family and its Coat of Arms. The obverse features the most recent portrait of Queen Elizabeth II by Jody Clark, while the reverse of the coin shows Timothy Noad’s take on the Royal Arms – first used in 2015. The Coat of Arms features a quartered shield, originally designed by Eric Sewell in 1983, bearing the three lions of England, the rampant lion of Scotland and the harp of Ireland. The shield is supported by the Lion of England and the Unicorn of Scotland on either side. Surrounding the shield is the inscription “HONI SOIT QUI MAL Y PENSE” – the motto of the Order of the Garter, which translates to ‘shame on him who thinks evil of it’. Last year the Royal Mint released another new design – the Two Dragons coin. This was tied in to the release of the Oriental Border Britannia coins, and was a nod toward the Royal Mint’s expansion into the Asian bullion market. This year’s release suggests that perhaps the Mint will continue to offer an alternative 1oz gold bullion coin on an annual basis going forward. 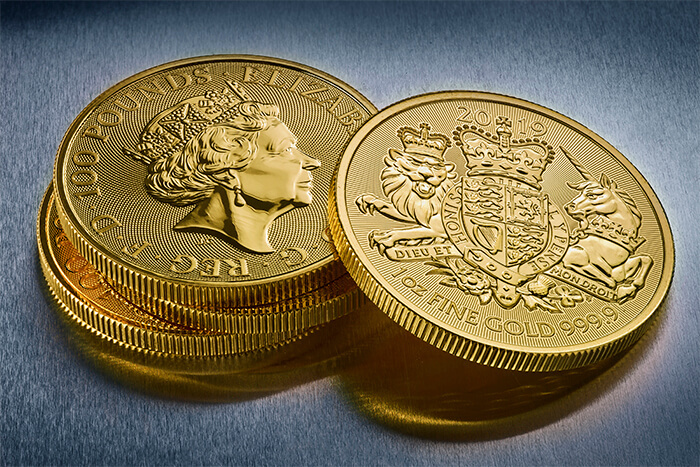 The 24-carat coin, unlike a lot of the Royal Mint’s newer bullion designs, is not being released on a limited mintage basis by the Llantrisant refinery.